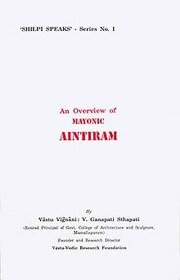 An especially excellent introduction to Mayan's Aintiram, and recommended for both the beginner and the long time student of the Vaastu Vedas. Sthapati holds the post of the Professor and the Head of the Department of Sthapatya Veda in the World University of Traditional Indian Science, Technology and Culture in Chennai. Some of the notable books he has authored include: Iconometry, Temples of Space Science, The Building Architecture of Sthapatya Veda, and Commentary on Mayan's Aintiram. Sthapati has earned a number of titles and awards including an Honorary Fellowship by the Indian Institute of Architects, the National award for Master Craftsmanship by the President of India, the title of "Shilpi Guru of India" also by the President and a Doctorate Degree conferred by the Maharishi Mahesh Yogi Vedic University. He has worked and researched the USA, U.K., Australia, France, Fiji, Germany, Holland, Singapore, Malaysia, Mexico, Guatemala and Peru.